As of September 1920, the US Quartermaster Graves Registration Service had successfully identified over 90% of the bodies of US servicemen who died overseas during WWI. The nation was still in mourning from the losses of the war, and the government looked to other countries for a suitable ceremony to honor those whose bodies were never identified. 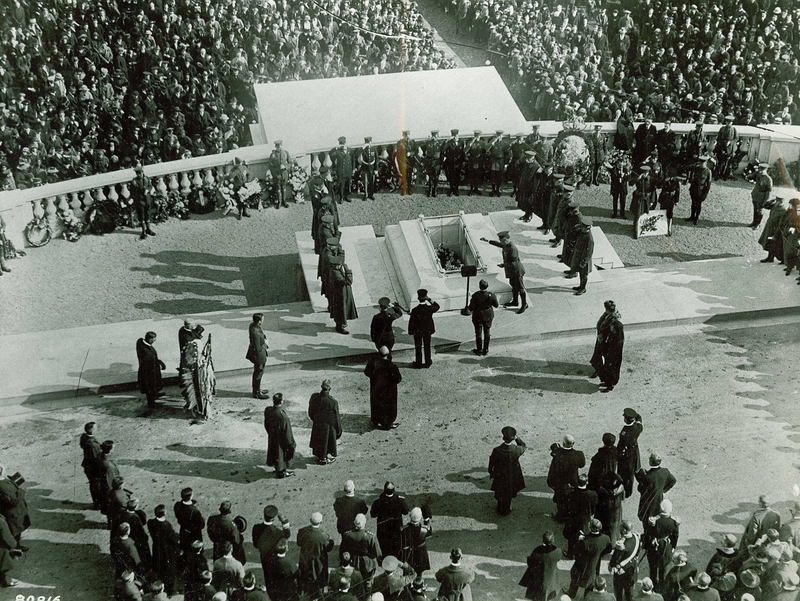 In the fall of 1920, the caskets of four unidentified U.S. soldiers were chosen for reburial in Washington D.C. One pallbearer, SGT Edward Younger, chose one body to be the Unknown Soldier of WWI. The remains were transported aboard the USS Olympia, the flagship of Vermont’s Own Admiral Dewey, and arrived home on November 9th, 1921. The body lay in state in the Capitol Rotunda for two days, where over 90,000 people quietly filtered through. This Unknown Soldier was buried with full services on November 11th, 1921. As I pawed through my large collection of WWI and WWII photography looking for a suitable candidate for a Veteran’s Day post, I came across one photo that stood out as a perfect blogpost. Although his identity is a mystery to me, maybe his name will come to the surface after this post hits the web. What a fitting photo post for Veterans Day! May I submit to you that the identity of the distinguished gentleman is Mr. Isaac B. Millner. US Navy, Civil War veteran –a seaman aboard the USS HARTFORD, flagship of Adm Farragut at the Battle of Mobile Bay 5 Aug 1864. 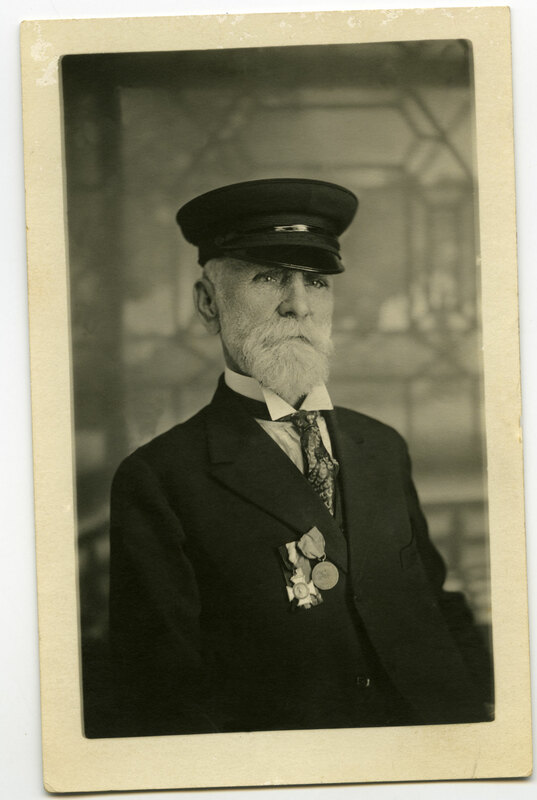 Millner had a life-long interest in Adm Farragut, attending several commemorations of Farraguts life and career. You will find many notations for him in Google under his full name as well as his initials I B Millner. He is mistakenly noted in the 1920 Census as Isaac B Mi-(one L) ner. 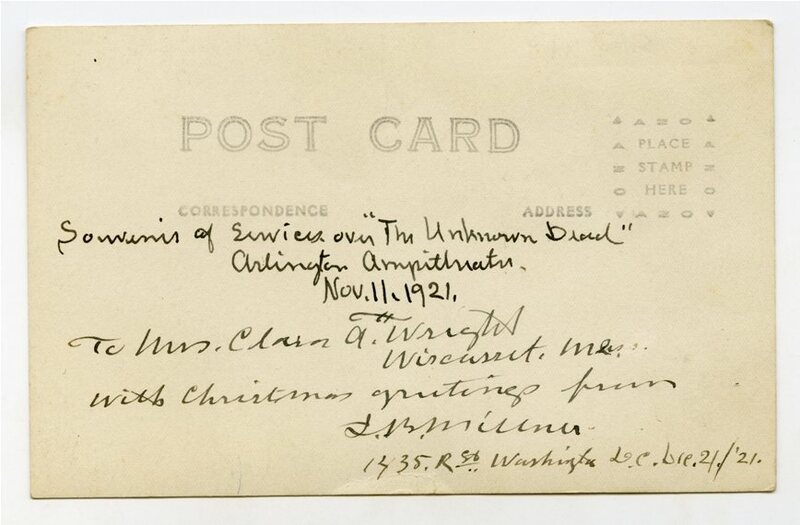 What his relationship with Mrs. Clara A Wright Of Wincasset, Maine, might be is unclear, but one might note that the description and the address texts on the back of the portrait were written in two distinctly different hands. It could be that Mrs. Wright was a friend of his wife Mrs. Mary Millner. Thanks much for posting all of the photos and stories. I work at the ROTC Department at UVM. We have a bunch of historical photos in our building of UVM Training in the early days. Stop by anytime!